Yr Ysgubor at Penrallt Y Cordde in Glynarthen, near Aberporth sleeps 7 people. Penrallt Y Cordde near Aberporth is set amidst unspoilt countryside with lovely valley views, and just a couple of miles inland from Cardigan Bay. The three cottages at Penrallt Y Cordde offer the perfect location to enjoy the Marine Heritage coastline. There are several award-winning beaches nearby, remote sandy coves and small fishing villages nestling amidst the stunning scenery. Tresaith, Penbryn, Cei Bach, Llangrannog and Mwnt are just a few worthy of a visit and several beaches are dog friendly all year round. The three cottages sit within the resident owners’ 15 acres of land, where they have their own farmhouse and pastures, meadows, woodlands, ponds and stream. Each holiday cottage is different but all are equally comfortable and with unique features. The Grade II listed detached cottage, Bwthyn Barri (ref OW9 [Bwthyn Barri]) is believed to have been built in 1711 and is full of character with beams and exposed stonework, and has an inglenook fireplace with wood-burning stove. 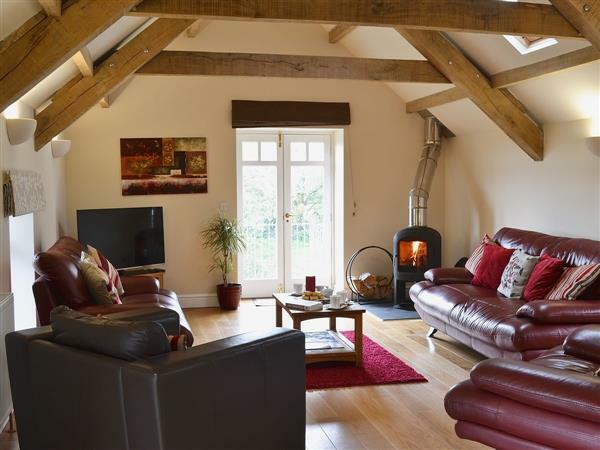 Y Cartws (ref OW8 [Y Cartws] and meaning ‘cart’), and Yr Ysgubor (ref OX1 and meaning ‘barn’), have been created from an old stone barn and now offer contemporary accommodation in a sympathetic conversion, also with beams, vaulted ceilings and exposed stonework. The Ceredigion Coastal Path takes in spectacular cliff top views and ‘Cardi Bach’ buses connect with various points along the route. Designated a Special Area of Conservation, Cardigan Bay is home to bottlenose dolphins, harbour porpoises, grey seals and a variety of sea birds. You can take a dolphin spotting boat trip from New Quay harbour, or just enjoy fish and chips and watch them from the harbour wall. It’s no wonder that writer Dylan Thomas was inspired to settle here for some of his life. There are plenty of attractive towns and villages to discover nearby, including Cardigan and its castle, the colourful harbour town of Aberaeron with elegant painted Georgian buildings, impressive Cilgerran, and bustling Newcastle Emlyn. Cosy pubs, chic shops, antique centres and good restaurants in the area, and for the more sporty, there are plenty of outdoor activities available including cycle routes, windsurfing, sailing, kayaking and a canoe centre at Llandysul. Just a few miles further inland the scenic Teifi Valley offers excellent opportunities for fishing as well as attractions such as the Teifi Valley Railway, the National Wool Museum, the National Coracle Centre and falls at Cenarth. Whether you are looking for activity filled days or quiet relaxation and contemplation, Ceredigion has it all and Penrallt Y Cordde offer the perfect base from which to enjoy your holiday or short break. The shop is ¾ mile from Penrallt Y Cordde near Aberporth, with the pub and restaurant 2¼ miles. Double bedroom with en-suite bathroom with spa bath, separate shower cubicle and toilet. Further double bedroom with additional single bed (for +1). Bunk bedroom. Shower room with toilet. First floor: Spacious, open plan living room with dining area, wood-burning stove, wooden floor and French doors to external stairs to garden. Spacious kitchen with tiled floor. Pets allowed at Penrallt Y Cordde - Yr Ysgubor. For a better idea of where Penrallt Y Cordde - Yr Ysgubor is, you can see Penrallt Y Cordde - Yr Ysgubor on the map below. Penrallt Y Cordde - Yr Ysgubor is in Dyfed; should you be on the lookout for a special offer, you can find all the special offers in Dyfed. It's always worth checking to see what is on offer at the moment. Do you want to holiday near Penrallt Y Cordde - Yr Ysgubor (OX1), you can see other cottages within 25 miles of Penrallt Y Cordde - Yr Ysgubor; have a look to find your perfect holiday location.